Calibrated and next test aluminium foil labels. Calibration jumbo write and seal labels. Calibration, calibrated write and seal labels. Calibration, calibrated label. Medium format. Write on surface. 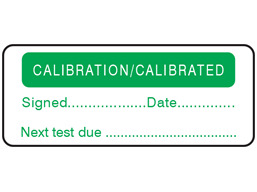 Part of our quality assurance and calibration label range. Supplied in packs of 100 labels. Calibration labels. Calibration, calibrated label. Comply with ISO 9001 accredited and other quality systems. Self adhesive polyester, with write on surface. Suitable to identify instruments, tools, gauges and test equipment within a calibration system, or outside that system. Supplied in packs of 100 labels. CA10001 Size 20mm x 50mm. Material: self adhesive polyester.